Chancellor Angela Merkel of Germany weighed into the issue of Ukraine with the most significant Western political development since the beginning of the crisis, while Russian forces are massing on the eastern border of Ukraine in what could be just a show of force, or preparations for further incursions. "eine Katastrophe für die Ukraine"
She specified such results as freezing bank accounts and strict travel restrictions. She knows that this will hit the Russian financial oligarchs where it hurts, as they have been channeling their money into foreign accounts as a hedge against the fragile and still-building Russian financial system. She also ruled out a military response, but the Russians as well as anyone else with a pulse already know that that was off the table from the very beginning. The Western military systems have been steadily and deliberately deteriorating for decades and no viable military response was ever possible, even assuming the will to use them. As with the old British political aphorism, one should always grant gracefully that which one has no power to withhold. The reason that Merkel's statement arises beyond the level of mere pontificating is that Germany is the economic hub of the European Union. I expect that Putin, with a military response off the table, knew that an economic retaliation was the only problem that he had to fear, but he gambled that it was unlikely due to Europe (again, read 'Germany') being already mired in trying to rescue the 'hangers-on' economies of Greece, Cyprus, Italy, Spain, Portugal, and Ireland. Indeed, it was Russia that principally stepped in to shore up the Cypriot banking system (incidentally one of the favorite off-shore repositories of large Russian bank accounts), so it saw what it expected to be the limits of European economic capability. With Merkel's determination, Russia thought wrong. While not close, the two leaders have an understanding of each other. 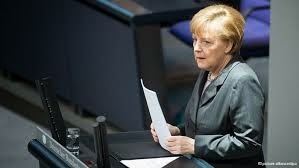 Merkel speaks Russian, having been raised in Communist East Germany. Putin speaks German, having been assigned there as a KGB major. Merkel also buried some significant references in her speech, which Russia nevertheless should read quite clearly: "In a period of enormous uncertainty in the Ukraine, Russia has not proven to be a partner for stability for neighboring countries which it has close links to, but it uses their inherent weaknesses." Translation: beware of doing anything with the Baltic republics, which also still contain significant Russian populations, or others. The fact that these other countries have joined NATO should prove to be hedge to Russian aspirations, but Putin has already shown his optimistic attitude about his use of power. Georgia, for example, into which Russia thrust itself in late 2008 by seizing (or freeing, to use the Russian term) the territories of South Ossetia and Abkhazia, could still be available for further demonstrations of Russian re-imposition of its manifest destiny. The fact that he is most meddlesome in Georgia and Ukraine, which both openly aspired to NATO membership, is telling. I also like the use of her declarative tense: "Let me be absolutely clear so that there is no misunderstanding, the territorial integrity of Ukraine is not up for discussion", a reference to the upcoming plebiscite in Crimea about becoming part of the Russian Federation – again. I expect that she is using that phraseology (the "absolutely clear" part) in a manner that is historically much different than its use by Obama. Neither she nor Obama will do a damn thing militarily and thank goodness for that. Let the Ukranians fight their own battle. Russia not only has nukes but the ICBMs and shorter (i.e. German-) range missiles to deliver them. But I do worry about these economic "sanctions." They are by definition acts of war. Our turning them on Japan, for instance, led to Pearl Harbor.